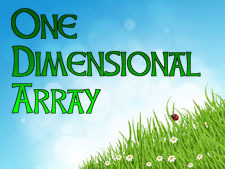 What is single dimensional array? How to declare one dimensional array? How to use single dimensional array in C# programming? The one dimensional array or single dimensional array in C# is the simplest type of array that contains only one row for storing data. It has single set of square bracket (“”). To declare single dimensional array in C#, you can write the following code. The array age is a one dimensional array that contains only 5 elements in a single row. In this chapter you learned about single dimensional array in C#. You also learned how to store value and access value from single dimensional array. In next chapter you will learn about multi dimensional array in C#.